Some people fear them and others cherish them as beloved pets. Reusable Art has a growing collection of rat drawings and pictures for you to use on your projects. 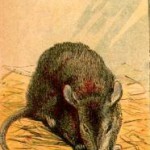 All of the rat images are copyright free and in the public domain. These images are offered free of charge but we would love it if you dropped us a line how you used them. We might even feature your project on ArtFilledDays.com! 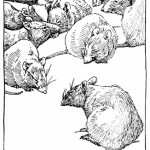 Vintage drawing of rats by Charles Livingston Bull (1874 – 1932). Black and white, pen and ink style drawing in the public domain. 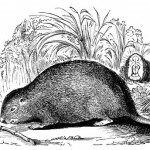 Drawing of a gray rat nibbling on some straw. Vintage illustration of this Chinese critter.